America's National Academies have released a (freely available) new primer [*.pdf] on the achievements and promise of plant genome sciences. Based on an expert consensus report [*.pdf] from the National Research Council, the booklet explores the potential of the National Plant Genome Initiative [*.pdf] - a federal multiagency project that coordinates research in plant sciences to understand and ultimately harness plants' properties to help meet agriculture, nutrition, energy, and human health needs. For example, by knowing how plants cope with less water, rising temperatures, and other environmental stresses, scientists could develop crops that withstand changing climate conditions. 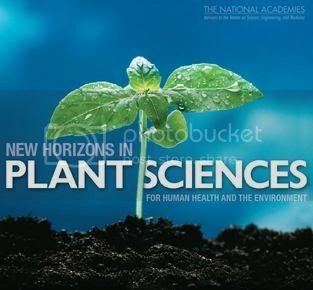 Sections of the booklet examine mutations and manipulation of food crops, the promise and challenges of biofuels, environmental stewardship, biomedical advances, and how scientists can maximize the use of plant sciences [entry ends here].